Government provision of goods and services will always leave consumers and taxpayers wanting, because of the absence of a profit motive. "Public servants" will never be fully motivated to serve the public as there are no conferred benefits for performance or negative consequences for non-performance. Here are five common excuses for government non performance. 1. The existing legislative framework is inadequate - Obviously, we need to enact new legislation and create another regulatory agency so that we can avoid this failure in the future! For successful people an important principle adhered to is taking personal responsibility for their decisions and their consequences. This doesn't mean that we fail to acknowledge actual obstacles that may impede our progression, rather it means acknowledging that sometimes bad things happen -even to good people. The true determinant of success however is appropriately and resolutely responding to life's challenges when they arise. Though the above description reeks of an overused cliche, this personal approach to life is the antithesis of the default human condition. For this reason many reflexively blame others or "the system" if they find themselves in circumstances that are less than favorable. Why? Its a basic human psychological defense mechanism used to resolve feelings of inadequacy or personal deficiency. Inspite of the job market becoming more and more competitive; universal, proven job search methods to land great opportunities remain. A job seeker would be well advised to incorporate the following strategies in their job search. 1. Identify 10 - 15 potential companies with all your preferred work characteristics. You should not be waiting until they advertise positions as this puts you at a severe disadvantage and increases the number of potential candidates you'd be in competition with. It should also be noted that most jobs are never even advertised. Donald Sterling, Los Angeles Clippers owner, was recorded by his mistress making some crude racist remarks. Since then, Sterling's racist comments have dominated the news, from talk radio to late-night shows. A few politicians have weighed in, with President Barack Obama congratulating the NBA for its sanctions against Sterling. There's little defense for Sterling, save his constitutional right to make racist remarks. But in a sea of self-righteous indignation, I think we're missing the most valuable lesson that we can learn from this affair — a lesson that's particularly important for black Americans. 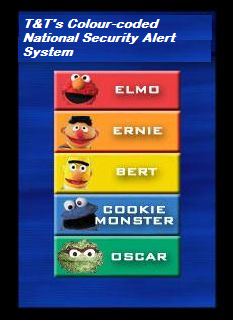 T&T's "Security Alert System" No More Than "Theatre"
Government recently implemented a Colour-coded National Security Alert System to indicate "the level of national security threat". The National Operations Centre (NOC) supposedly advises the National Security Council who decides on the security level. In a recent article it was reported that T&T was experiencing a falling birth rate (currently 15.2 births per year per 1,000 people), equivalent only to the population replacement rate. Further, the Health Minister revealed that 34 per cent of T&T’s men have a low sperm count. Although plausible explanations were presented for this decline, including environmental pollution, obesity and diabetes -other lesser explored, yet compelling societal explanations abound. 1. The increasing number of women pursuing tertiary level education because of GATE are resulting in women delaying engaging in marriage and motherhood. As a result women are dedicating the most fertile years of their lives to academia only to render themselves "less fertile" after pursuing academic qualifications. Moreover, after investing tremendous time and effort on achieving academic qualification, many women are inclined and/or feel obligated to stedfastly pursue their careers at the expense of motherhood and family life.